This genuine Venetian carnival inspired masquerade mask is lavishly decorated in macrame silver with beautiful feather plumes, ready to flatter with your chosen masked ball costume. Fantastic for people who wear glasses as it comes on a handle! 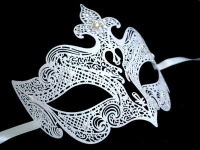 If for your special occasion or themed event, style means wearing a mask which is hand made in Venice and of quality craftsmanship then this genuine Venetian art piece is the choice for you. Buy a mask that is “Made in Venice” and you are taking the opportunity to help keep alive a time honoured skill. Mask making in Venice started in medieval times. Craftsmen produced the original masks using papier mache which they left to set in a plaster cast. When dry, they applied the base paint, the coloured layers and the macramé, gems and brocade that turned the mask into a work of art. Venetians wore their masks throughout Il Carnevale, taking on the roles of different characters and enjoying the carnival atmosphere. Thanks to a revival in the late 1970s, the Venice Carnival became popular once more and still lives on today. Every year thousands flock to the City in search of a good time and become part of its history. They choose to wear the most elaborate masks in the hope of winning first prize for the best. Now, you can bring a part of the Carnival atmosphere to your masked ball. Every mask is unique. Look closely and you will see the paintbrush strokes and the fine layers of paper that make up the foundation of the mask. Machine and mass produced masks have much less of the individual design and appeal. Easy to hold, the Brama stick mask fits comfortably around the contours of your face and is perfect for people with glasses. Delivery is free throughout the UK. 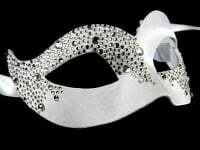 Order your masquerade mask today.